Approx. 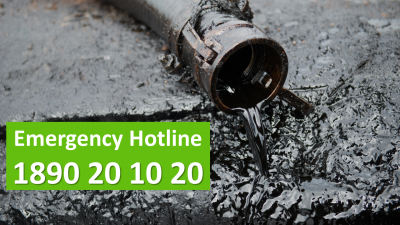 200L of kerosene oil leaked from the oil tank. 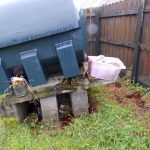 Physical and analytical evidence of gross oil migration and contamination impact encountered in soil in garden and in the main chamber of the septic tank with free phase product observed at surface. 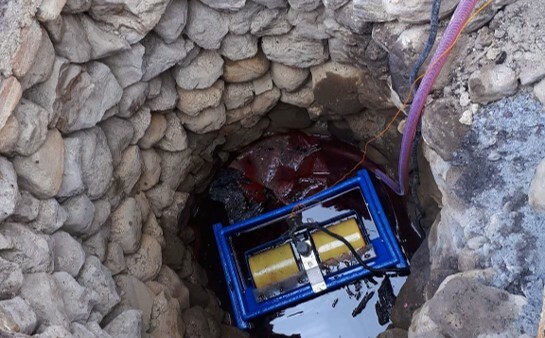 Excavation of interception trenches, recovery sumps and the installation of a pump and treat system to reduce the on-going risk of oil migration towards the building and prevent further impact to human receptors, buildings, groundwater and the wider environment. 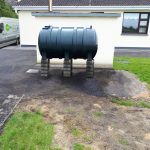 Free phase oil product skimmed off the septic tank. A temporary heating system was set up on site. All pump equipment was removed from the pump house. Concrete sections were broken out and removed to facilitate excavation works. Pipework was exposed in the garden. The concrete wall in the back garden was demolished and removed. The pump house was demolished. 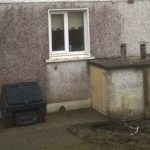 The contaminated soil and fill material in the back garden was excavated and removed. 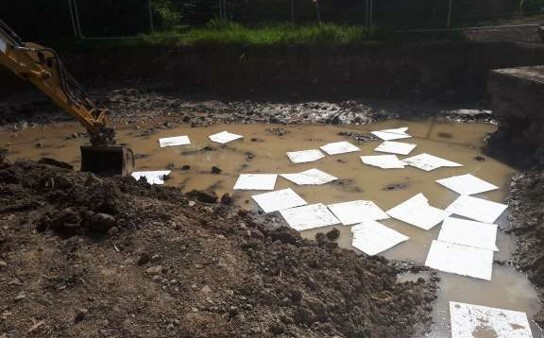 Extensive excavations were carried out across the rear garden which included the excavation and removal of approximately 292 tonnes of contaminated waste. 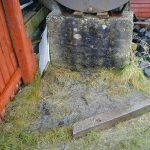 Absorbent materials applied to the standing water in the excavation to remove any free oil. 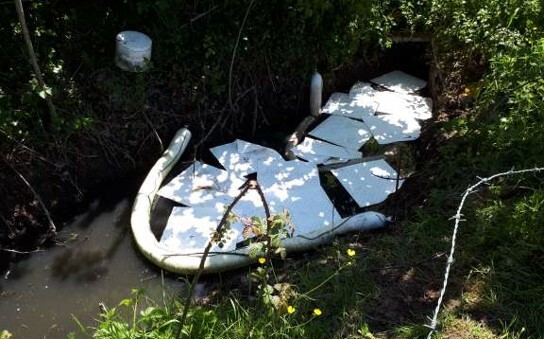 Absorbent materials and booms were installed in the ditch adjacent to the property to prevent and remove any free oil entering the ditch. Specialised treatment solutions applied to the base and sides of the excavation over a number of weeks to treat residual contamination. 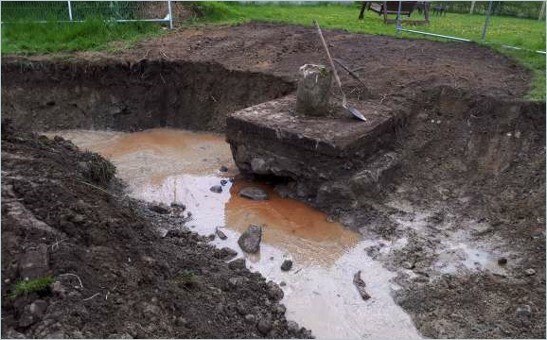 Free phase oil in the old well on site was pumped out and removed. 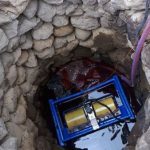 Dissolved phase oil in the former well was also treated using a pump and treat system. During the source removal phase of works the insured became concerned that the excavations carried out immediately adjacent to the gable wall of the original house may affect the stability of the wall. Verde understand that historical structural remedial work was previously carried out to the front corner of the original house and involved crack stitching and underpinning. Verde engaged structural engineer Peter Ryan of Hendrick Ryan and associates who inspected the property on 3rd May, 2018. 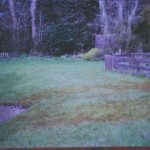 Peter concluded that he was “satisfied that the work undertaken by Verde has no detrimental effect on the stability of the original gable wall”. 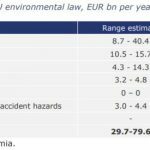 A full structural engineering report is included in the appendices of this report. 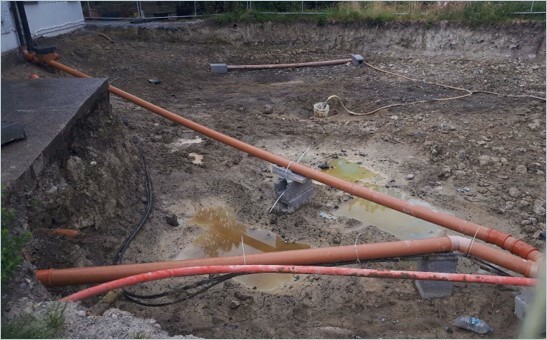 The waste pipework was re-set within the excavation prior to backfilling (see Photo 16). The excavation was backfilled with a granular backfill material and compacted at regular intervals (see Photos 17, 18 & 19). A new oil feed line was installed during backfilling works (see Photo 18). A new concrete oil tank base was poured (see Photo 21). 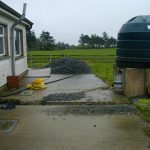 New concrete footpaths were poured at the rear of the property (see Photos 22 & 23). A new oil tank was placed on top of the new concrete oil tank base (see Photo 24). 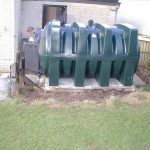 The oil tank was reconnected and the heating system was recommissioned.